The Colorado Avalanche entered a March 22nd matchup against the Phoenix Coyotes on a 6 game point streak , going 5-0-1 in those games. That streak put them in the seventh spot in the Western Conference, and many saw them holding on to make the playoffs. The Avs had been one of the best teams in hockey since the trade deadline, and seemed to have finally moved on from season long consistency problems. Phoenix, however, jumped out to an early lead on Colorado, ending the streak 3-2 in regulation. Since then, Colorado dropped 4 straight, a 0-3-1 record. Making matters worse, two of these losses came to the Coyotes and Sharks, two teams in direct competition for the 7th and 8th seeds in the Western Conference. The Avalanche also found themselves being swept by the Vancouver Canucks this season, losing two games to them this week. All games, with the exception of San José, have been one goal losses. Even though the team has played fairly well, it seems very likely that they will be on the outside of playoffs when they begin on April 11th. After the games ended yesterday night, Colorado sat just two points behind 8th place San Jose. The gap widened by the fact that the Avs have played two more games than every other team ahead of them in the West, and one more than Calgary, who is directly behind them. Suddenly, the two point gap becomes much harder to overcome with only three games left on their schedule. In order to even have a chance at the playoffs, the team must win games against Calgary, Edmonton, and Nashville. One interesting aspect of the Avalanche missing this year’s playoff is their current draft scenario. Usually, missing the playoffs is not a terrible alternative for a young team looking to add another piece. 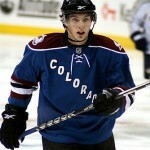 However, Colorado traded away their first-round draft pick last summer to the Washington Capitals for Semyon Varlamov. The trade has benefited the Avalanche, as Varlamov is the main reason the team is in the playoff race now, but coming up short in the playoff race this year stings a little more knowing there is no real benefit. All things considered, this season should be considered a success for such a young club. Obviously improved, Colorado will finish around 20 points better than last year’s total of 69. Goaltending and defense saw dramatic improvements this season (going from dead last to currently 14th in goals against per game). The offseason promises plenty storylines in Denver, as the team is full of free agents. Without a first round pick, it will be easier to bring back the team’s core, especially forwards Matt Duchene and Ryan O’Reilly.